Library computers are maintained and supported by ETSU Information Technology Services (ITS). Contact the ITS Help Desk for help with logging in, using installed software, or printing. Windows and iMac desktop computers are available on the 1st floor in the Information Commons. Windows computers are available on the 2nd and 3rd floors. There are no computers available on the 4th floor. 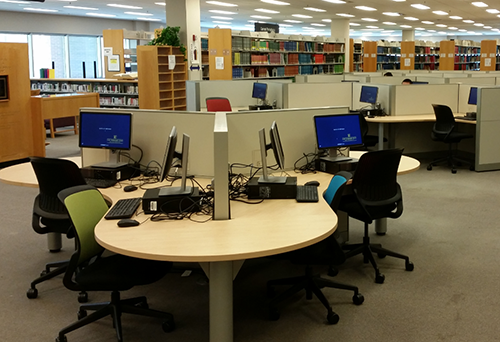 Current ETSU students, faculty, faculty emeriti, staff, and Library Guest cardholders may use library lab computers. All users must log in with their ETSU username and password. Visit ETSU password security for help with (re)setting your password. There are no enforced time limits on computer use. By logging in you agree to comply with the ETSU Information Technology Services Code of Ethics. Library computers are ETSU property. Individuals found engaging in unlawful activities will be asked to leave the library.